« 5 Reasons to Thank Your New Siding! With Hurricane Matthew threatening the East Coast and the Mid-Atlantic region, homeowners naturally become more aware of how susceptible their home is to damage from the elements – hurricanes or otherwise. One home improvement option we recommend is installing a storm door to protect your front door from the elements, and add security and value to your home! A storm door is an additional outer door that protects your main entry door from weather and the elements. A properly installed storm door creates a seal to prevent rain, ice, snow, and other outdoor elements from reaching and damaging the main entry door of the home, which is often fairly expensive to replace or repair. 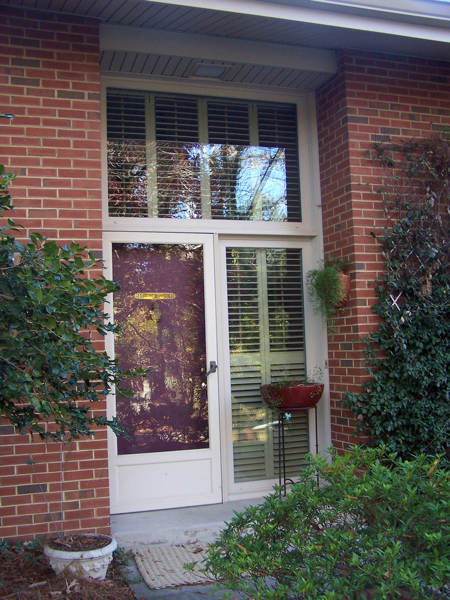 Entry doors are often the main points of air leakage in and out of a home. Adding this additional layer of a door creates better insulation between the home and the outdoors, and thus offers a more energy-efficient solution for your entryway in any season. If home safety is a major concern, there are storm doors with enhanced safety measures, like thicker frames, multiple locks and security grilles. Styles with locking mechanisms offer the added bonus of one more barrier of security from unwanted visitors or intruders. Storm doors with screen panels offer the right amount of light and fresh air into your home when the weather is nice and you may not necessarily need both doors closed. Whether Hurricane Matthew decides to visit North Carolina or not, you’ll want to consider a storm door for added protection against the elements in any season. Gerald Jones Company are the experts in the Raleigh-Durham region for entry door replacement and storm door installation. We’d love to talk with you! This entry was written by Gerald Jones Company, posted on October 7, 2016 at 4:12 pm, filed under Uncategorized and tagged Hurricane Matthew, Storm door. Bookmark the permalink. Follow any comments here with the RSS feed for this post. Both comments and trackbacks are currently closed.